An old Arabic legend tells of the date palm's creation: "After God had finished molding Man from Earth; He took the remaining material and shaped it into a date palm which he placed in the Garden of Paradise". Accordingly, the date palm tree became a holy symbol and is historically mentioned in the Bible, the Koran and other religious volumes. The exact origin of the first date palm is not known; however, the earliest finds trace back as far as 5000-6000 B.C. in Iran, Egypt, and Pakistan. Evidence of date palm cultivation goes as far back as 4000 BC in what is now southern Iraq. In the pre-Islamic archeology, the agricultural settlement of southeastern Arabia was predicated upon the domestication of the date palm in 2500 BC. The date palm was known in West India, now Pakistan, as far back as 2000 B.C. Yet, since the antiquity of the date culture scopes around the Persian Gulf, it is suggested that the date palm may have originated in that region. In all cases, there is general agreement that the history of date palm is as old as the history of man himself. Despite it’s origin being lost in antiquity, the date palm and their fruit have been celebrated as the tree of life. The Mesopotamians recognized the tree's versatility and value providing all of life’s necessities. Its sweet fruit became an essential part of their diet and the palm offered "three hundred and sixty" uses including medicine, building materials, shelter, fuel and materials for weaving and basket making. Dates have been growing in Southern California for more than a century. Date palms flourish in high summer temperatures and low humidity with minimal rainfall during the summer and fall making the desert oasis of the Coachella Valley a prosperous setting. The first date palms in California were seedlings planted by Franciscan and Jesuit missionaries in 1769. As commercial date production established in the interior valleys of California and Arizona, growers sought out new varieties. Around 1900, as part of a U.S. Department of Agriculture program to find crops from around the world, which would grow well in the United States, “agricultural explorers” visited Algeria, Iraq and Egypt. 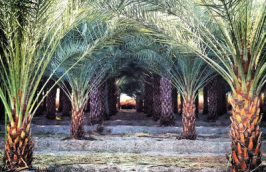 They returned with Deglet Noor date offshoots, and after planting in a number of regions, found the Coachella Valley had the perfect climate for the crop. 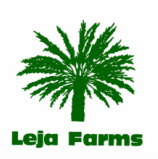 Additional offshoots from the same three countries, Algeria, Iraq and Egypt were acquired and planted which laid the foundation of the modern California date industry. California date production had its beginning in 1912 with the first harvesting and marketing of the Deglet Noor fruit. In 1927, the Medjool date was introduced to California from Morocco in an attempt to save the date palms from extinction. A rare disease was destroying Morocco’s Medjool crop. Eleven offshoots were acquired however only nine survived. Eventually, the variety began to thrive and now, together with the Deglet Noor, make up the two most popular and commercial date varieties in the United States. With the marketing of California Dates, farmers and business leaders believed consumers might find the Middle Eastern connection romantic. In the Coachella Valley theaters adopted Arabian themes, the town of Indio built a fairground with turrets and the Old Bagdad stage, and towns were named Mecca, Thermal and Oasis. To celebrate the Coachella Valley date harvest the first Date Festival was held in Indio, in 1917. Presently, the annual ten-day celebration is in February renamed in 1946 when it partnered with Riverside County and became known as the Riverside County Fair and National Date Festival.